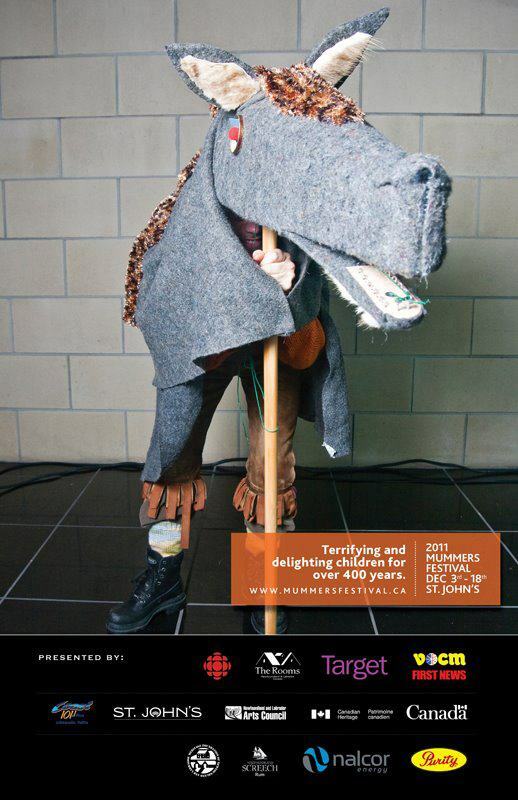 The poster above was one designed by Target Marketing for the 2011 Mummers Festival. 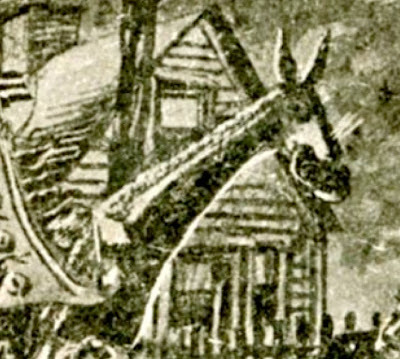 It bears the caption "Terrifying and delighting children for over 400 years" and the image of a handsome mummer (yours truly) peeking out from inside a great grey horse's head. This is a hobby horse - and not the child's riding toy hobby horse most North Americans are familiar with. The hobby horse of Newfoundland's mummering tradition is much more fearsome beastie, with big eyes, and a wooden jaw with nails for teeth, which snock together as it nips and bites at the people it meets along its route. It is an archetypal figure associated with chaos, unpredictability, fertility, and, as the poster suggests, even a little terror. When we started planning the very first mummers festival in 2009, we went looking for hobby horses. Chris Brookes, who started the Mummers Troupe in 1972, had a couple, one of which, "Old Ball" is shown to the right. Local actor Andy Jones had one. One was found tucked away in the MUN Folklore and Language Archive. The Kelly family in Cape Broyle had another, made of styrofoam to replace an older, wooden head. But other than those few models, very few existed outside of reminiscences. Andrea O’Brien contributed memories of hobby horses from the Southern Shore, and a man from Bonavista Bay remembered a hobby horse made out of an old cardboard beer carton. The hobby horse was a Newfoundland Christmas tradition which, not particularly widespread in the twentieth century, had seemed to have faded from both the cultural landscape and popular memory in the twenty-first. It was a shame, for hobby horses have a long and complicated history. Besides for solace of our people, and allurement of the Savages, we were provided of Musike in good variety: not omitting the least toyes, as Morris dancers, Hobby horsse, and Maylike conceits to delight the Savage people. 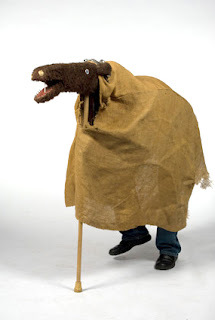 "Hobby horse" and "Horsy-hops" both get their own entries in the Dictionary of Newfoundland English, and folklorist Dr. Joy Fraser has included references to hobby horses in her stellar research on mummering and violence in nineteenth century Newfoundland. Fraser includes one account, where a complainant in a legal case describes how “I heard some person running and turned round I was struck on the head with something like a horses head and knocked down I rose on my knees to get hold of the man who struck me and he kicked me on the breast”. A 1913 Christmas engraving by John Hayward includes, in the background, what can only be a hobby horse (detail below). Folklore research in the 1960s and 1970s uncovered many stories and references to hobby horses and bulls, but by the time the Heritage Foundation of Newfoundland and Labrador instigated its first Folklife Festival in 2009, very few hobby horses existed, no one had made any for years, and most people had never heard of the tradition. Mummers Festival coordinator Ryan Davis, working with long-time Lantern Festival organizer Kathleen Parewick, designed a cardboard template to make a hobby horse head, and the hobby horse workshops which were first offered in 2009 have since become a firm part of the annual festival. 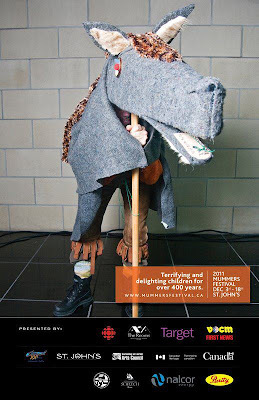 The hobby horse workshops have been taught outside of the festival, as part of ICH workshops, community centre outreach programs, and workshops for high school teachers. 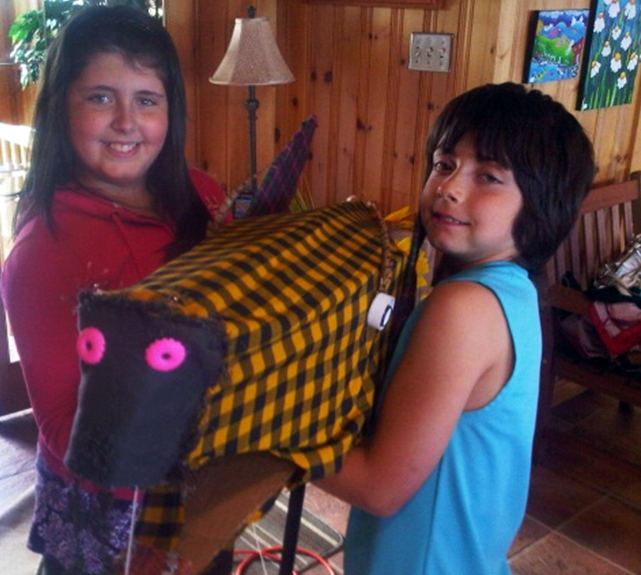 One of the participants in a hobby horse building workshop I taught in Bay Roberts, Delaney brought along Meggie and Kaegan, who now represent a new generation of hobby horse owners. 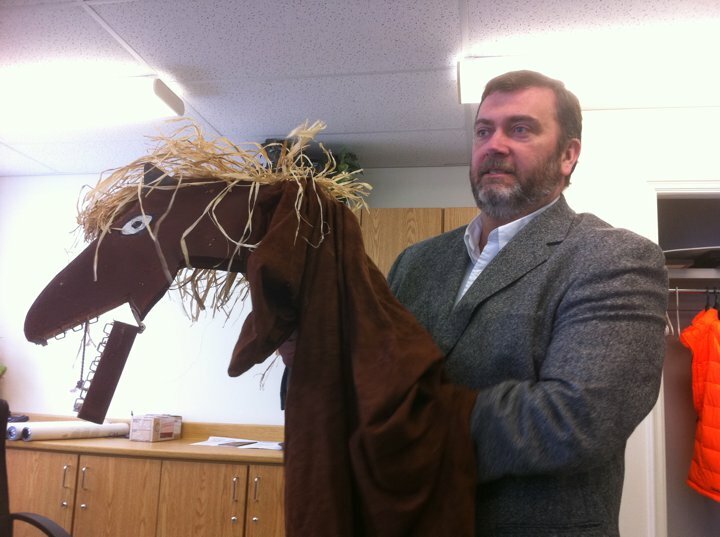 Another horse foaled that day made its way back to Ontario, to take place of honour as Bottom's Head in a Grade 8 student production of Midsummer's Night Dream. One of the participants in a 2011 Arts Work Conference hobby horse making workshop I taught in St. John's was teacher Amanda Gibson, who teaches at Amos Comenius Memorial School in Hopedale. She made her hobby horse, then went off to Labrador armed with her new skills. Horses not being common along the northern Labrador coast, Gibson adapted the template, adding hobby polar bears to the list of hobby animals now made in the province. "The kids had a fun time making them and loved choosing the colors for their 'bears'" she wrote me. "It took a few hour-period classes, but it was a great way to end the unit in Grade 8 NL history on 19th Century Lifestyles for students that are hands-on learners." This year, 2011, there were hobby horses galore at the Mummers Parade. Everywhere you turned, a gaudily-decorated horse's head was poking up above the sea of mummers and janneys, including one devilishly fine, black and red steed, crepe paper fire billowing from its nostrils. For me, it was a particularly moving sight, and proof that tradition is sometimes more resilient than we give it credit for. For whatever reason, hobby horse making has struck a chord with a new generation of janneys, and I look forward to new additions to the herd in 2012.